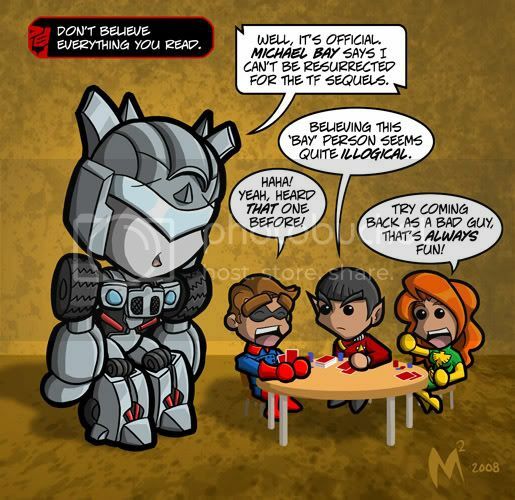 Discussion in 'Transformers Fan Art' started by MattMoylan, Jan 7, 2008. Haha Bucky, Spock, and Jean grey FTW. Lol I like this idea of an evil jazz. Heh....got a bit of a chuckle from this one. whos bucky? Funny tho still!!!! Nicely done as always Matt! Ha! Jean looks so cute for someone who destroyed an entire planet. No Jason Todd or Superman? Nice touch there throwing Phoenix into the mix. Hey Matt! How about you do one about one of the most-hated comic book events in history: "ONE MORE DAY!"